Donald Trump has taken to calling Bernie Sanders a Communist, another example of his willingness to scapegoat, distort and incite people for political gain. But this isn’t the first time a demagogue has deceived America, or that a Vermonter took him on. 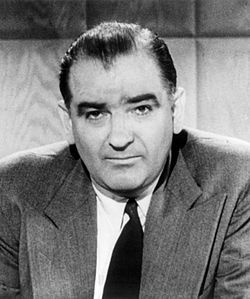 By 1954, having already ruined lives and caused innocent people to be blacklisted and jailed, McCarthy was accusing army officers of communist sympathies. Even President Eisenhower handled him cautiously. Vermont Senator Ralph Flanders wasn’t the most likely candidate to confront McCarthy. A self-educated inventor, businessman and son-in-law of James Hartness, a former governor, Flanders was a pragmatic conservative who enthusiastically defended free enterprise. President of the Boston Federal Reserve Bank before his election to the Senate, he was also a devout Christian who believed “the world seems to be mobilizing for the great battle of Armageddon.” But he had heard enough from McCarthy in the Senate to be concerned about the country’s direction. Columnist Westbrook Pegler initially drew McCarthy’s eye to Vermont by writing about a supposed communist cell in the Randolph-Bethel area. Local anti-communist fanatics Lucille and Manuel Miller were accusing public figures, from Vermont’s superintendent of schools to former governor Ernest Gibson Jr., by then a federal judge, and even Eisenhower, of communist leanings. Making matters worse, former State Department official Alger Hiss, who was convicted in a notorious espionage case, once owned property in Peacham. Flanders watched the fear of communism cloud the judgment of state officials, who had attempted to examine textbooks for subversive influences and amend the state’s Sabotage Prevention Act, a remnant of World War I. The legislature rejected the proposal to review textbooks, as well as Gov. Emerson’s bill to ban suspect political parties. But that didn’t stop the University of Vermont from dismissing medical school faculty member Alex Novikoff for refusing to discuss his Communist involvement as a student with a Senate subcommittee. By March 9, 1954 the usually soft-spoken, 66-year-old Flanders had finished watching and started to speak. Rising on the Senate floor, he mocked McCarthy for spreading confusion and sowing division. “He dons his warpaint,” Flanders said. “He goes into his dance. He emits war whoops. He goes forth to battle and proudly returns with the scalp of a pink dentist.” Flanders was referring to an army officer, the only example of a communist sympathizer in the military McCarthy had been able to produce. Congressional testimony on the alleged threat inside the military began in April. During what became known as the Army-McCarthy hearings the Wisconsin senator accused the Secretary of the Army of interfering with his investigation. The Army countered that McCarthy had sought favors from a military aide. The hearings were broadcast live on television for weeks, the first event of its kind. Unfortunately, most Vermonters couldn’t tune in. The state’s first TV transmission tower wouldn’t go up until several months later. Flanders was there, however, in the building, and by June had heard enough. In another broadside attack, he compared McCarthy to Dennis the Menace and Adolph Hitler. “Were the Junior Senator from Wisconsin in the pay of the Communists he could not have done a better job for them,” he charged. On June 11, he further escalated the confrontation, entering McCarthy’s hearing room in front of television cameras to hand him a note, an invitation to be present when Flanders spoke in the Senate again. The future of the country was on a knife edge. On one hand, the Supreme Court had ruled unanimously on May 17 that segregation was illegal. In Brown v. The Board of Education of Topeka, Chief Justice John Marshall said, “We conclude that in the field of public education the doctrine of ‘separate but equal’ has no place.” A week later, however, the same Court upheld the Internal Security Act, which made Communist Party membership grounds for the deportation of non-citizens. The French garrison at Dien Bien Phu in Vietnam had fallen to insurgent forces led by Ho Chi Minh and Vice President Richard Nixon was urging U.S. intervention. In Guatemala a right-wing coup financed by the CIA overthrew the elected President, Jacobo Arbenz, whose government had nationalized the property of the United Fruit Company. In this highly charged atmosphere, with public opinion divided – even in Vermont – Flanders went to the Senate floor and introduced a resolution to remove McCarthy from the chairmanship of the Senate Oversight Committee. This put the Republican Party in a bind. McCarthy was an embarrassment, but Flanders was going too far, challenging Senate rules regarding committee chairs and seniority. He was at the epicenter of a struggle over the fate of the country. Drawing on his pragmatic side, Flanders consulted with colleagues and took a small but crucial step back. Instead of demanding McCarthy’s removal from leadership, he proposed a censure motion. The struggle continued for months, right into the 1954 mid-term elections. Even though Flanders was a Republican, he worked with the National Committee for an Effective Congress, whose explicit aim was to elect a Democrat majority. The issue was too important to let partisan politics stand in the way. That Fall the Republicans lost control of the Senate. Flanders’ resolution initially avoided reference to any specific actions or misdeeds by McCarthy. As he explained, « It was not his breaches of etiquette, or of rules or sometimes even of laws which is so disturbing. It was his overall pattern of behavior.” A special senate committee, chaired by Utah Republican Arthur Watkins, was appointed to evaluate the proposal. 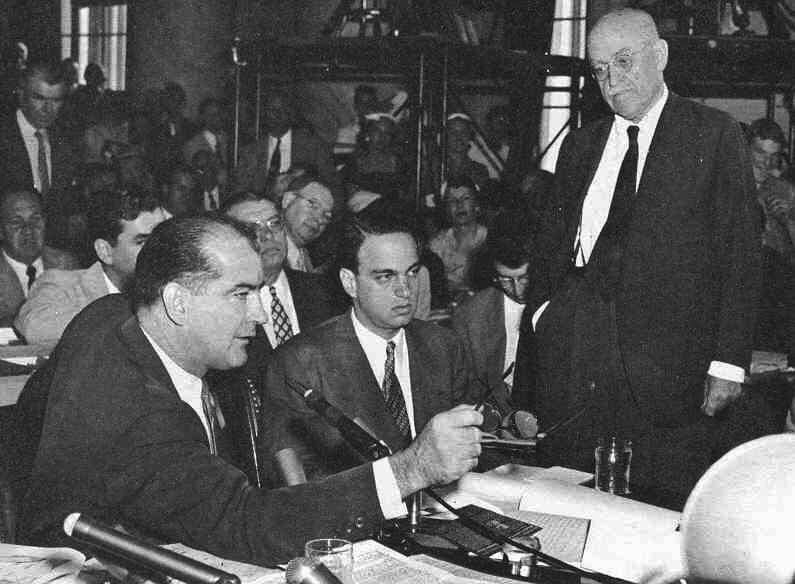 It proceeded to weigh 46 complaints itemized by Flanders, other Senate members and witnesses, in the end recommending censure on two counts: that McCarthy had obstructed a Senate Subcommittee attempting to investigate him, and had denounced a fellow senator « without reason or justification » and acted in an « inexcusable » and « reprehensible » manner toward Brigadier General Ralph Zwicker, a witness before his investigating committee. Flanders was no revolutionary. But through bold action at a crucial moment he expressed enduring attitudes toward authority, dissent and tolerance. Though clearly a New England conservative in many respects he also expressed libertarian and egalitarian ideas, as well as being a forceful advocate for accountability, all in all a prime example of the Vermont Way. This essay is adapted from Greg Guma‘s forthcoming book, Green Mountain Politics: Restless Spirits, Popular Movements.